Warning! 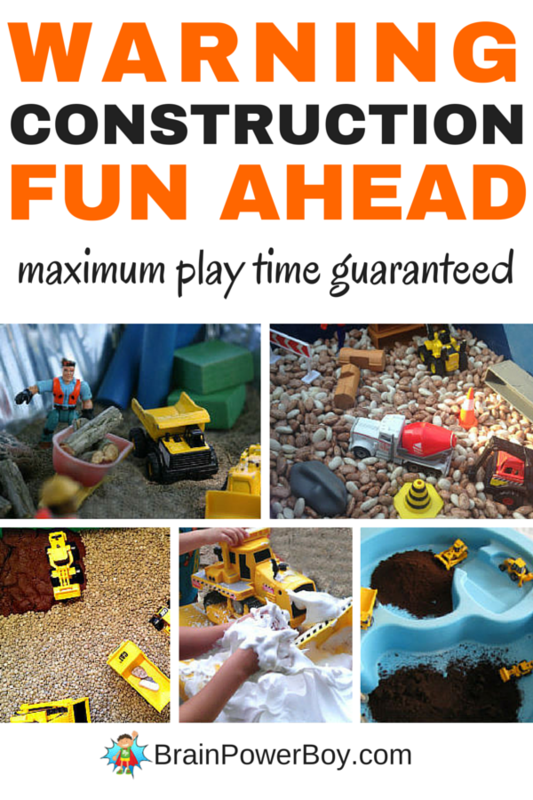 Construction Sensory Bins Fun Ahead. 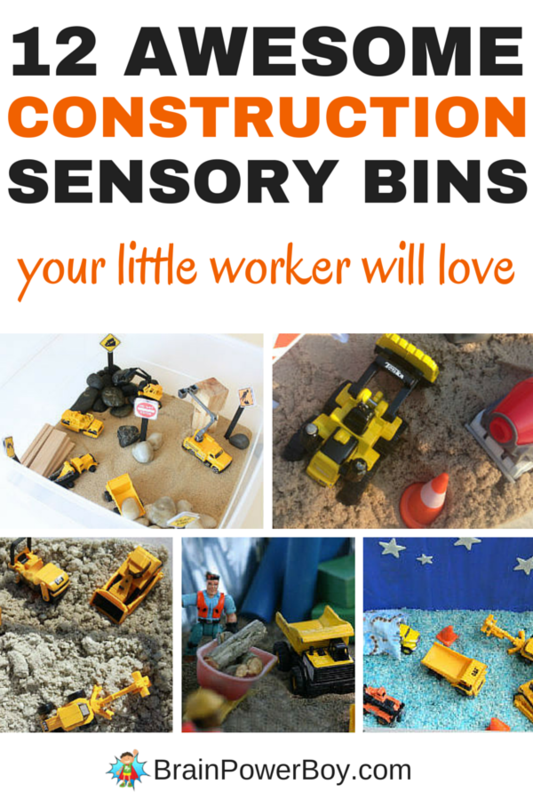 Oh, what fun your little construction fan is going to have with these wonderful construction sensory bins. We really “dug around” until we found the best bins out there. We just love bins as they lend themselves to so much open-ended play. Imaginative play is essential for learning and sensory bins are very engaging and kids just love them. 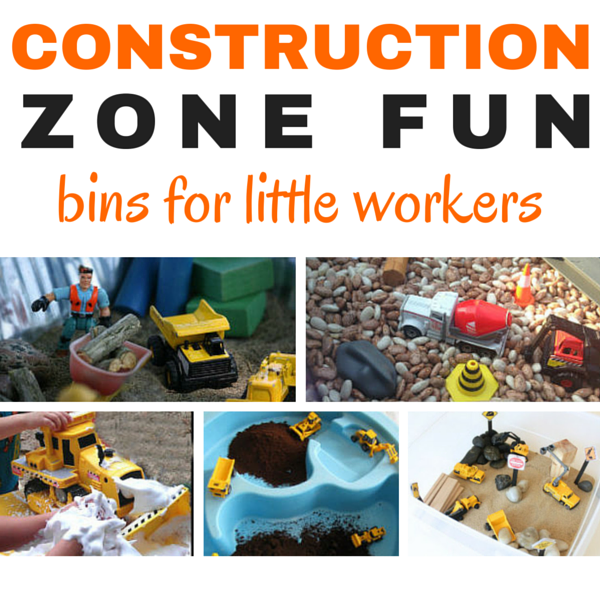 Let your little worker help build your bin or surprise them by having one ready to go. Either way these 12 construction bins are winners and will give you a lot of fun ideas. This article is part of our activities for boys series. You are going to love these bins! Goodnight Construction Site is a wonderful book and this bin idea includes a story and a bin. So cute! The truck even has a blanket! If you like the idea of book-related bins, be sure to have a look at Read and Play with Book Sensory Bins. What I like about this easy construction bin is that they added chocolate playdough for mud! Super idea. What I like here is that they did some construction while creating their bin for added play value. They built a small pond with a bridge and a tunnel. Both were very easy and I’m sure her boy enjoyed making them and yours would too. The signs in this bin are what drew me to it. They are free printables so you can make your own. I bet your boys are really going to like having signs for their play ideas. They also have this set up as a gift to give. Neat idea! Construction Bin Gift Idea. Here is one using potting mix as a base. There are some good bark pieces in there that would be great for constructing. Two great construction bin ideas are found on Elemeno-p Kids. There is one bin with kinetic sand and one with beans. I really like the kinetic sand idea because it molds and moves which is an added engaging feature. I found a very clever idea. She took a cardboard box and cut part of it down so you could get your hands in to play. She then painted a background on the box and added a scene. She also put plastic down in the bottom of the box to contain the sand. Construction Site Diorama. Brilliant. For a completely different idea check out this construction sensory bin with shaving cream. Using sand and grains together along with some rocks and dowel rods this construction site sensory play idea looks like a lot of fun. I love that she added a construction hat – nice touch. For an unusual filler, try coffee grounds. If you have a sensitive boy I would make sure he is ok with the smell before making this. This is a pretty neat idea. Coffee grounds look just like dirt but are pretty easy to clean up. This neat construction bin is a winner. It has a lot of great features including sand, little logs, rocks, and even a few construction figures. I can see kids playing with this one for a long time. Fix up a bin that will work great for your child. Mix things up, take an idea from one and combine it with another. Make your own unique bin that he will really enjoy playing with. Set one up as a surprise or enlist their help in creating the perfect bin. They will likely have some wonderful ideas of what to add and an opinion on how it should look! 10 Things Boys Learn from Sensory Bins Plus Awesome Bins! My kids would love all of these construction bins. They will be perfect for this winter to inside (as long as I have have the vacuum nearby) when they cannot get in their sandbox. Thanks for sharing at #made4kids! Trucks and shaving cream – oh, my daughter would LOVE that one! Pinning these awesome ideas!